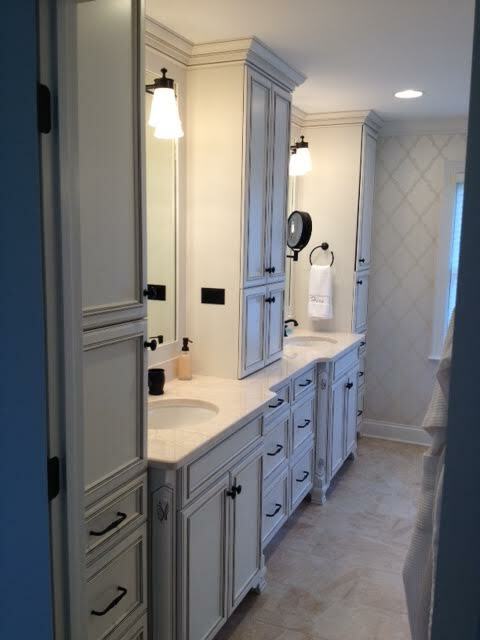 We recently finished another master bathroom design and remodeling job for a client. We are not completely done with this design because our custom window treatments and small area rugs are still missing, but we will post some more pictures of this re-design at a later point. 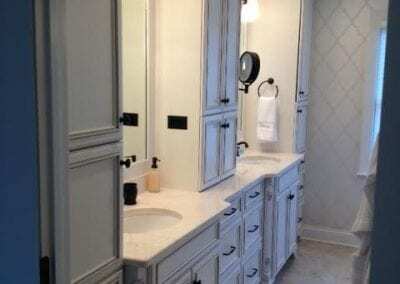 This bathroom is very dreamy and soft with the color scheme – our hues range from white to cream and pearl. 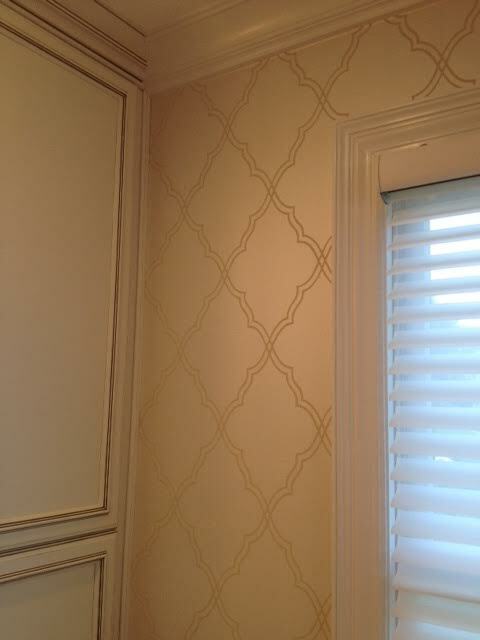 The wallpaper has a geometric design and a slight shimmer, which adds to the elegance of this bathroom. 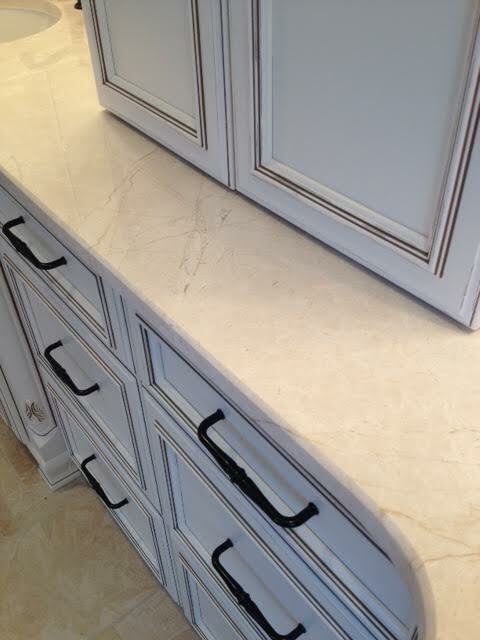 For our countertop we chose a marble top with subtle veining going through it the same is reflected in our flooring. 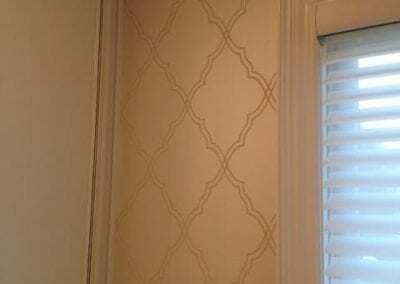 The vanity lights were placed right on top of the mirror and framed in with custom molding. 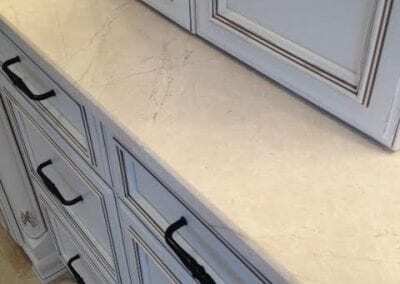 The cabinets have a subtle pencil line on the trim which adds extra depth and brings out more of the design details and they all feature soft close drawers. The lighting (which I will need to get a close up picture of) is our Visual Comfort Lighting with an oil rubbed bronze finish, which also matches the vanity mirror and all of our faucets and hardware. We also replaced the old regular wooden blinds with new Hunter Douglas silhouettes with a light room darkening sheer fabric/lining.